By Samuel Mckenzie, BScReviewed by Dr. Surat P, Ph.D.
Adipose tissue-derived stem cells (ADSCs) develop from mesenchymal cells. ADSCs have numerous applications in the medical and biomedical science fields, including the treatment of diabetes and the regeneration of tissues. 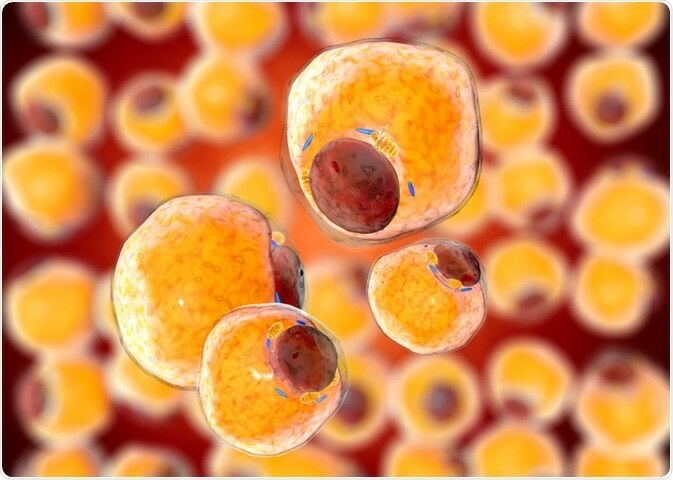 What are adipose tissue-derived stem cells? Adipocytes (adipose tissues) develop from mesenchymal cells through a series of signaling and transcriptional cascades. The differentiation of adipocytes is very complex and involves changes to cell morphology, hormone sensitivity, and gene expression. ADSCs are stem cells that are derived from adipocytes and can differentiate into many different cell types, but are more restricted compared to embryonic stem cells (ESCs) and induced pluripotent stem cells (iPSCs). Flow cytometry can also be used to isolate ADSCs from other stromal cells within a cell solution. Flow cytometry is possible because ADSCs contain stem cell-specific cell surface markers, such as CD90, CD105, CD44, and CD166. ADSCs are used in regenerative medicine therapies as they can differentiate into a variety of different cell lineages. These stem cells also have anti-apoptotic, anti-inflammatory, pro-angiogenic, immunomodulatory, and anti-scarring effects, which make them extremely effective. As ADSCs are mesenchymal in origin, they are mainly used for tissue regeneration, particularly in osteogenic, adipogenic, chondrogenic, and cardiovascular areas of medicine. Many studies have investigated the regenerative effect of ADSC from numerous sources including rodents, rabbits, and humans on bone regeneration. ADSCs have been used to reconstruct the calvarial defects of a young girl following a severe head injury. Necrosis of the femoral head can lead to pain and osteoarthritis, and ADSCs have been injected into patients suffering from this. The treatment enhances the osteogenesis of the necrotic tissue. Initially, ADSCs were used in fat transplantations to correct facial defects and breast reconstruction. Improvements in fat grafting techniques are based on the enrichment of the graft with autologous SVF, platelet-derived growth factors, hormones, and insulin. Growth factors, such as fibroblast growth factor-2 can also be used to promote the proliferation of ADSCs. ADSCs can additionally be used in plastic surgery as their ability to produce cytokines, chemokines, and growth factors reduces the risk of scarring. Past research has uncovered myogenic potential in ADSCs. This has fostered an interest in cell therapies for cardiovascular and myocardial tissue regeneration of the muscle tissue within the heart (myocardium). ADSCs produce cytokines that reduce apoptosis of cardiomyocytes or activate stem cells to increase cardiomyogenesis, both of which can improve cardiac function. Following acute myocardial infarction, ADSCs can be injected intracoronary to improve cardiac function, perfusion, and remodeling of patients. The generation of new β-cells is an important approach when treating type 1 diabetes mellitus (type 1 DM). A recent study transplanted insulin-producing cells (IPCs) derived from ADSCs into rats with streptozotocin-induced type 1 DM. The rats that contained the differentiated IPCs showed a significant increase in the expression of pancreatic β-cells markers and insulin secretion, regeneration of β-cells, and the diffusion of proliferated islet cells. What does the future look like for these versatile stem cells? ADSCs are very versatile and can be differentiated into many cell types within the mesodermal lineage. The treatment applications discussed above are just the tip of the iceberg when considering all applications of ADSCs within medicine. Further research will provide efficient ways in which ADSCs can be used for mesodermal regeneration and other diseases.